Even without any medicine, the mice that consumed this olive oil showed a “significant reduction in symptoms of Alzheimer’s disease,” Kaddoumi told Greek Liquid Gold. Moreover, according to a manuscript by Yazan S. Batarseh and Amal Kaddoumi which is now in press at The Journal of Nutritional Biochemistry, high oleocanthal extra virgin olive oil (EVOO) combined with the Alzheimer’s drug donepezil produced even more impressive results than either the drug or the EVOO alone. Batarseh and Kaddoumi point out that Alzheimer’s disease (AD) is “the most common neurodegenerative disorder affecting the elderly population.” There is no cure for Alzheimer’s; only a few treatments for symptoms, including donepezil, are available, and these have limited effects. Their advantage is that medical foods tend to be a safe, affordable, and widely available way of reducing symptoms, whereas new medications take a long time to develop and reach the public. Oleocanthal rich EVOO has not yet been designated a medical food by the U.S. Food and Drug Administration (FDA), but Batarseh and Kaddoumi suggest that its health benefits provide good reason to consider such a designation. In the recent study in Louisiana, mice with mutations that lead to Alzheimer’s symptoms were fed the equivalent (for their size) of the amount of olive oil Mediterranean diet followers would eat in a day. 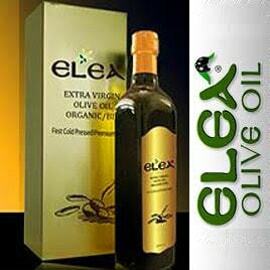 In previous studies by the same research team, pure oleocanthal was given to mice, and it produced a similar effect. The use of actual high oleocanthal olive oil in the diet is new here, and it is this result that suggests oleocanthal rich EVOO may deserve to be designated a medical food. The mice were divided into four groups of 12, with a control group fed regular powdered food from ages 1 to 5 months, another group fed oleocanthal-rich EVOO mixed with powdered food at the same ages, a third group treated with donepezil starting at age 4 months for 1 month, and a fourth group fed the EVOO mix from ages 1 to 5 months and treated with donepezil for a month starting at 4 months of age (since EVOO consumption in humans can begin early, but treatment for AD begins later, if necessary). With the greatest improvement seen in mice given both EVOO and donepezil, results suggest that long-term use of EVOO rich in oleocanthal “as a medical food combined with donepezil offers an effective therapeutic approach” to Alzheimer’s. The EVOO both enhanced the positive effect of the medication and provided additional benefits this medicine cannot offer. While donepezil has little impact on brain inflammation and has no antioxidant effect, EVOO was seen to increase antioxidant levels and decrease inflammation. 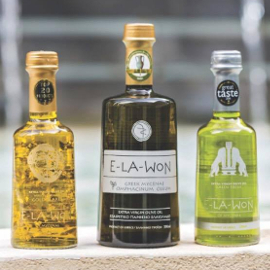 The mice in the recent study received “The Governor” brand of EVOO from Greece, which is unusually high in oleocanthal (680 mg/kg). 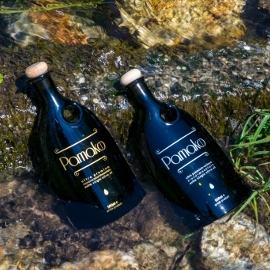 Donated by its producers, the Dafnis family, this monovarietal Lianolia olive oil from Corfu received a Gold Award from the Olympia Health and Nutrition Awards in 2016 because it contained the highest level of oleocanthal discovered on the world market (with 565 olive oils tested for those awards alone). 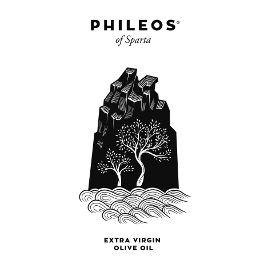 Spyros Dafnis tells Greek Liquid Gold he considers his family’s work producing olive oil for scientific research both a blessing and a responsibility. 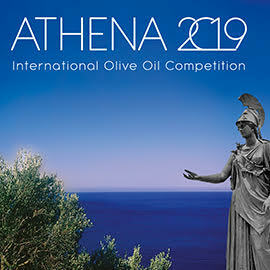 He thinks of their olive oil’s citation in international scientific literature as both a great success and “only the beginning.” They work very hard year round, combining tradition with technological innovation and scientific research for a “very strict harvest and production process every year.” That process led to “the first single-variety olive oil from the centuries old Lianolia variety of Corfu in the global market” as well as “one of the first EVOOs in the world to add the ‘health claim’ report to its label” in 2013. Dr. Prokopis Magiatis of the University of Athens told Ta Nea newspaper that it remains to be seen “whether the great results of American research will also be valid for the human body.” He added that "an initial response” to that question will come from “the first international clinical trial in patients with early Alzheimer's symptoms using olive oil rich in oleocanthal,” which has been underway for almost a year in Greece and should yield some results this year. Thanks to Amal Kaddoumi, now at the Harrison School of Pharmacy, Auburn University, for the photos of her with her research team. This work was performed at Dr. Kaddoumi’s previous affiliation institute, the University of Louisiana at Monroe. After someone questioned the safety of oleocanthal on a Facebook page focused on olive oil, I asked Dr. Prokopios Magiatis, who has been conducting research on olive oil at the University of Athens for years, about that. Magiatis explained, “All bioactive compounds like oleocanthal or flavonoids may be health protecting or toxic depending on the dose.” Scientists including Magiatis have been doing research “to find the natural levels of oleocanthal in all the varieties of olive oil, produced with all the possible ways, and thus to define the maximum natural levels.” Then they determine whether “there is any possible toxicity for the maximum dose that can be obtained through a usual diet.” Magiatis reports, “We have identified early harvest oils containing up to 2000 mg/Kg of oleocanthal, meaning that a 40g of oil daily dose can provide up to 80 mg of oleocanthal. In my opinion, this is the maximum dose that we should consider. I know many people who have consumed approximately 20-40 mg of oleocanthal through their food daily for years without knowing it, and of course there is no toxic effect. From a nutritional point of view, it is meaningless to worry about toxicity for doses >1 mg/Kg/day of human body weight, since it is extremely difficult to get this dose through the diet. Of course, if we are talking about oleocanthal as a medical drug, then yes, we should study the maximum tolerated dose. Some studies have found in animals toxicity at doses of 50 mg/Kg, meaning about 3.5 gr of oleocanthal per person, or 7 Kg of a high oleocanthal olive oil per day. In any case, we need to clarify these numbers and be sure about the medical safety of oleocanthal. 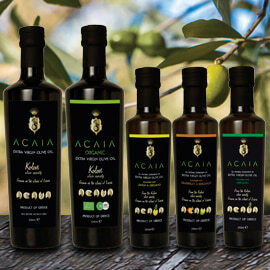 The nutritional safety is unquestionable, since it has been consumed like that since the ancient times, although the people didn't know that.” So unless you are consuming 7 kilograms of high oleocanthal olive oil per day, you probably don’t need to worry about getting too much through your diet!